Search for the best flight prices from Manchester to Copenhagen. Compare prices, book today and save money with Manchester Airport. The Danes are the happiest people on the planet! According to the UN's 2013 World Happiness Report, Denmark, with a score of 7.6, beats every other country on a global happiness scale from zero to 10! 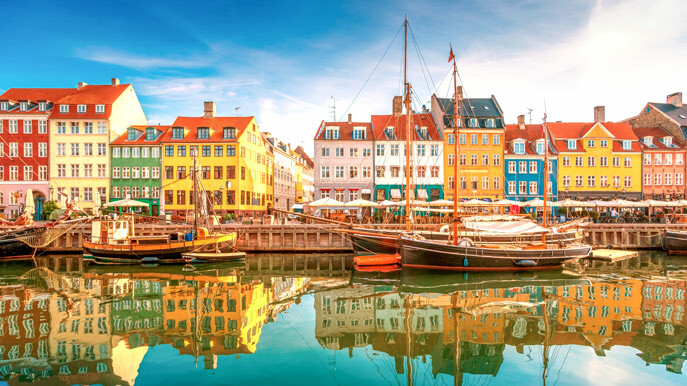 From boutique retreats and quirky hideaways to imposing centuries-old hotels, Copenhagen has accommodation to suit all tastes; but, as with much of the features of this city, stylish design is always the key ingredient. The cosy Andersen Boutique Hotel (Helgolandsgade 12) in Vesterbro is a keen exhibitor of Danish design, while the budget Wakeup Copenhagen (Carsten Niebuhrs Gade 11) doesn’t compromise when it comes to chic interiors. Those looking for old-world charm will love the harbourside four-star Copenhagen Admiral Hotel (Toldbodgade 24–28), a converted 18th-century warehouse around the corner from tourist hotspot Nyhavn; while an elegant option at the popular Tivoli Gardens is the Moorish-influenced Nimb Hotel (Bernstorffsgade 5). With its vintage fashion boutiques, contemporary design outlets and bustling markets, Copenhagen is a dream for shoppers. The latest trendy gear can be found in the streets surrounding King’s Square, including Nag People (Pilestræde 47). The hip Nørrebro district is a mix of big names, such as Acne Archive (Elmegade 21), as well as up-and-coming labels. Vintage fashion enthusiasts should head along Larsbjørnssstræde and stop at Carmen and Fantasio (Larsbjørnsstræde 11) to browse its 1970s and 80s items. Danish design devotees, meanwhile, can spend hours perusing the items at Illums Bolighus (Amagertorv 10). Flea markets are also found at various city locations, but the oldest and most varied is at Halmtorvet in Vesterbro. Voted the best restaurant in the world from 2010 to 2012, Noma (Strandgade 93) has garnered most of the attention in recent years, but there is more to Copenhagen’s culinary scene than the two-Michelin-star purveyor of New Nordic cuisine. The hippy enclave of Christianshavn is home to its own Michelin-star eatery, Kadeau (Wildersgade 10A), which recreates regional dishes from the island of Bornholm in the Baltic Sea. It’s not all wallet-busting fare, however, as there are plenty of inexpensive options, particularly for brunch and lunch. The animated Dyrehaven (Sønder Boulevard 72) is a good choice for cheap all-day bites, while mid-range options include fish specialist Kødbyens Fiskebar (Flæsketorvet 100) and the classy Les Trois Cochons (Vaernedamsvej 10). Scandinavia’s largest classical music festival, this four-month programme of more than 80 concerts takes place in the peaceful surrounds of Tivoli Gardens. Performers here range from established artists to up-and-coming musicians. Dancers in vibrant costumes spurred on by Latino notes, reggae rhythms and African beats wind their way through the pedestrianised Strøget during Whitsun weekend. The party then moves to Ørestad on Amager Island with various stalls and stages. One of the biggest celebrations of jazz in Europe, this festival has been running for more than 30 years and takes place in some of Copenhagen’s funkiest cafés and bars, as well as open-air venues and concert halls. All styles are covered, from the traditional to the contemporary. A five-day celebration of Copenhagen’s LGBT community, this multicoloured and multifaceted event culminates in a parade featuring more than 10,000 participants that traverses Vesterbro to City Hall Square. A dedication to documentary and a feast of feature film, the largest festival of its kind in the region encompasses screenings, talks, concerts and awards. More than 200 films are featured, with a focus on innovative, independently produced newcomers.